My son, Dash, is obsessed with the book "Room on the Broom" by Julia Donaldson. 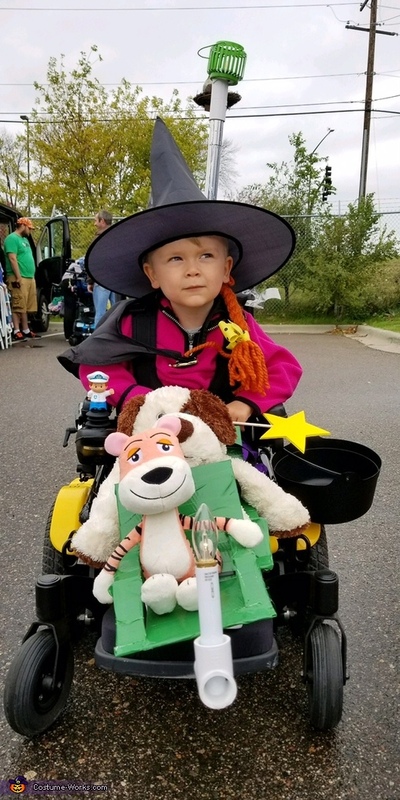 He definitely wanted to be the witch for Halloween, but since he uses a wheelchair, I decided to construct the "Truly Magnificent Broom" from the story. I used a PVC frame to attach the front and back of the broomstick to the chair. I also used PVC to create the piece that holds the bird. The seats were made with cardboard and colored duct tape. Lots of hot glue was used for all of the remaining connections. The nice thing about using PVC was that it could all come apart for transportation and it didn't cost all that much. My mom made the pants that he was wearing as well as the braided hair in a bow and we found the top at a consignment shop.